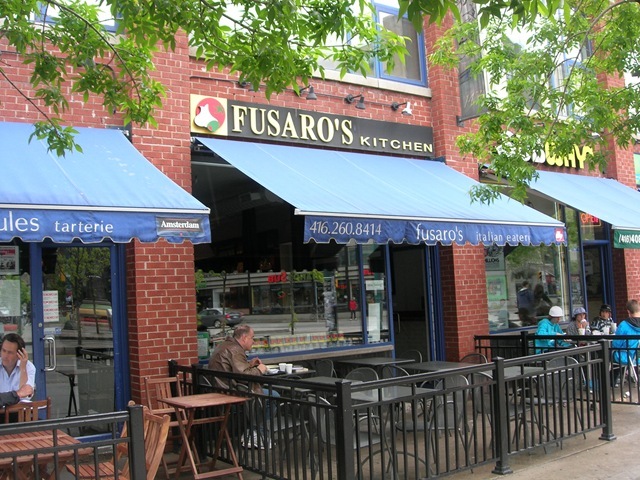 I have many friends who have tweeted their love for Fusaro’s Kitchen at 147 Spadina Avenue. At least twice a week, they would entice me with twitpics of gorgeous pastas that would glisten under their blackberries. They were adamant that if I was in the area at any point in time, that I would HAVE to invite them to lunch, as they wanted to share in my first experience at this Italian eatery. Miraculously, I happened to be in the area one day, and called up one of those friends, and was rejected when I requested a lunch date. Ouch! Well I couldn’t blame him, he was starving, and decided to satisfy his hunger pangs about an hour and a half prior to my arrival. I have no shame in eating alone, and walked down Queen trying to anticipate the menu selection (didn’t have time to do menu research ahead of time) and how good this place was going to be. I turned around, and was bewildered by the expression on the face of the girl who took my order. “You cannot take pictures in this establishment without asking the manager first.” She pointed to the woman beside her. This had never happened to me before, and after overcoming the shock I began to apologize. The manager didn’t budge a bit to give me the go ahead. Making my way to the table to await my pasta, I could tell the mood was heavy. This was supposed to be an exciting experience, but here I was counting the minutes till I was out of there. I awaited my order of pasta fiorentina featuring rigatoni, grilled chicken, and spinach all brought together with a tomato pesto sauce. It sounded delicious. My eyes scanned the room as I waited. 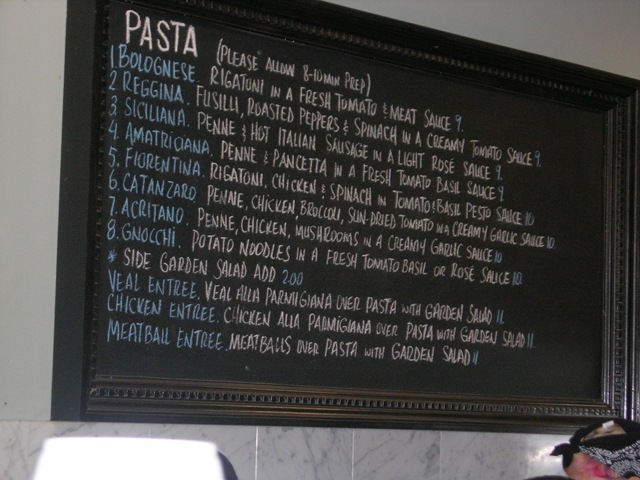 Alongside their menu of pastas, paninis, and salads they also sold Italian food products including dried pasta, San Marzano tomatoes, and olive oil. The display looked fantastic, and was the perfect temptation for any Italian food lover sitting within the vicinity. A huge bowl heaped with pasta arrived before me. It looked good, but how did it taste. Making sure I got a little bit of everything on my fork a la Giada de Laurentiis, I took my first bite. Yikes! 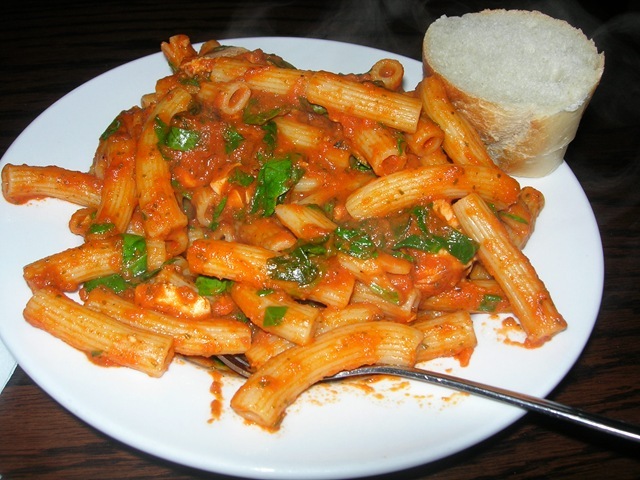 Meaning “to the tooth”, Al Dente is an expression in Italian used to describe the level of doneness that pasta or cooked vegetables should have when being served. They should be cooked to just the point when they have a little resistance when you bite into them. The pasta before me my friends was extremely overcooked. However it didn’t stop there. The sauce left much to be desired as it was under seasoned, and lacked the robust hearty taste one would expect in a tomato based sauce. I wanted to feel the love of a tomato sauce that had been stewed in a huge pot for hours like an Italian nona would do, but was betrayed. The marriage between all the ingredients was crumbling. After a few bites, I headed to the counter and asked the girl who served me if I could have a box to carry out my leftovers in. She pointed to a small styrofoam container. I knew I had more pasta left in my dish than that container could hold, so I requested something larger. I was then lectured on the capacity of the container, and how she was confident that everything would fit. Her attitude took off to another level. Then she came around to look at my dish, took it, and begrudgingly ended up packing it in a larger container. Wow, what happened to customer service nowadays? I won’t hold anything against you if you are a lover of Fusaro’s. One friend told me that he would boycott the place if I gave him the go ahead, but really, I’m not a bitter person. I just feel that the value (in all aspects) isn’t there for the amount of green you’re forking out. No need to start protesting. At least not yet. That being said, I think my friend’s lunch rejection was for the better. Firstly, he wouldn’t have had to deal with the horrible service at the restaurant. Secondly he wouldn’t have to had to listen to me drop hints on what I thought about the food. It’s too bad that he’s going to be reading this article. Oh well. I too found their pasta to be rather overcooked, but my sauce was quite awesome (and sauce is very important to me) so I agree and disagree on some points. I’d rather you go to Grazie on Yonge. Their pasta is to die for. Adelaide) so I ate at Fusaro’s at least once per week. I don’t remember it being awesome but it was pretty decent for a quick takeout lunch.